Thirty miles northeast of Mexico City, Teotihuacan (a founding member of my bucket list ) waited. Having spent a few days in Mexico City, skittish pre-travel advice/warnings to “book in advance”, “take a reputable tour” and “avoid public transit” had long since evaporated. We hailed a street cab, destination – Terminal de Autobus del Norte. At the bus station, paid 46 pesos each (under $4 Canadian return trip ) and hopped a coach leaving every 15 minutes for Teotihuacan. Going in I knew Teotihuacan (City of the Gods) was a UNESCO World Heritage site. The largest pre-Aztec city in central Mexico, covering 20 square kilometers, dominated by Pyramids of the Sun and Moon, both situated along Avenue of the Dead’s considerable 2.4 km reach. Above all I knew Pyramid of the Sun was lined with Mica, a sheet mineral prized for thermal conduction and electrical insulation properties. Mica quarried thousands of miles away in South America, mysteriously placed beneath the outer stone surface. Nothing prepared me for enormity of personal first impressions. An hour out of del Norte our bus arrived at Gate 1. Beyond a dusty entrance lined with vendors, map in hand, the Citadel lent dimension to scant comprehension of the task at hand. First photo – view of the Citadel from Gate 1. Above – looking into the Temple of Quetzalcoatl from atop the Citadel. From the Citadel, looking down Avenue of the Dead toward Pyramid of the Sun (right) and distant Pyramid of the Moon. Images along Avenue of the Dead. Above – first ever WordPress photograph of myself and husband. Evey step toward Pyramid of the Sun made the structure more implausible. Hot, thirsty, needing to process Teotihuacan, we timed out at Gate 5 for lunch at La Gruta. 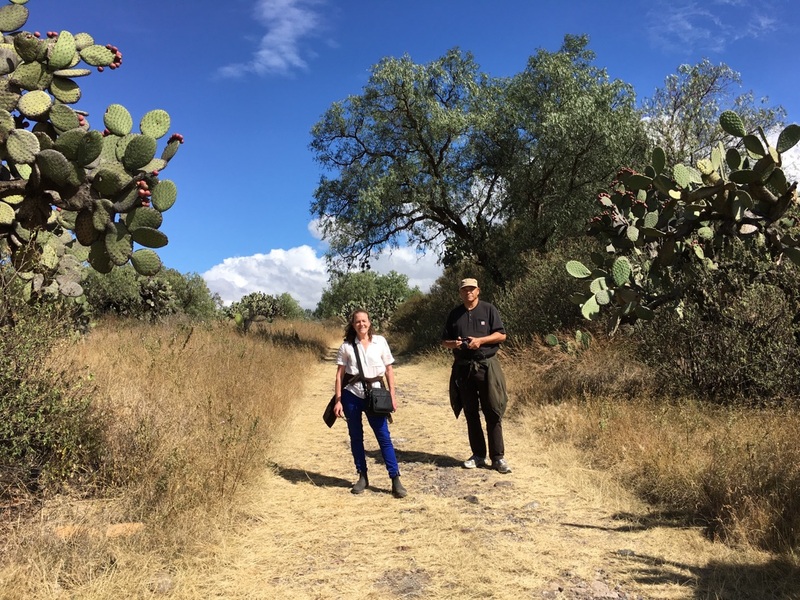 Refreshed and centered, we made our way to Pyramid of the Moon and adjoining Quetzalcoatl complex – Patio of the Jaguar and Temple of Feathered Conches. Leaving Teotihuacan, I smiled when my daughter said “look at your boots”. Covered in dust, I walked away carrying stony determination of lost civilizations in my heart. It was a perfect day.